Courtesans gathered chatting on the veranda of a Green House with the shōji (sliding doors made with paper) open, on a cheerful sunny day. Even the cat seems to be relaxed. 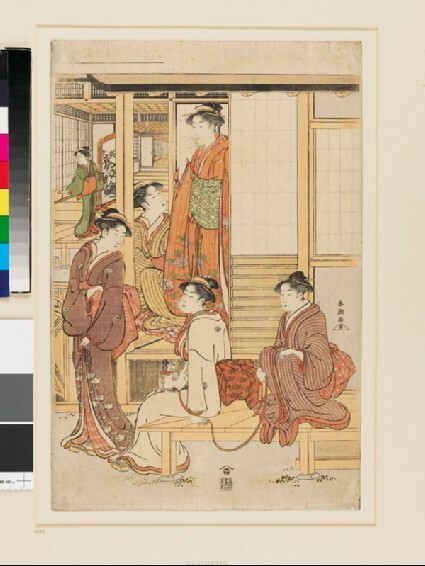 In the background Shunchō has, most unusually, used geometrical perspective, showing the details of the structure of a Green house of the period, easily divided into small rooms suitable for small parties. 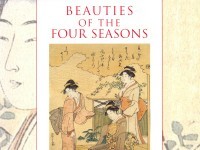 During the Edo era, the style and thickness of kimono was changed four times a year. These girls are wearing awase (lined kimono) which were worn in early summer and late autumn. The design of chrysanthemum on the kimono of the central standing girl may relate to the Chrysanthemum Festival in September.